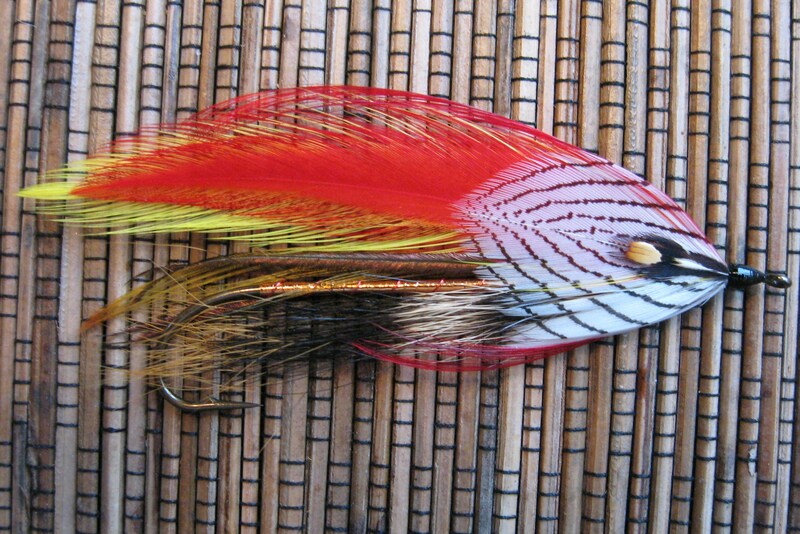 Here is another fun fly from the creative mind of Gary LaFontaine. The Air Head is an attractor pattern. Utilizing clear packing foam, it is a bright fly; in fact, sometimes perhaps a little too bright. I have seen it pull trout from a good distance only to suffer a last second refusal. 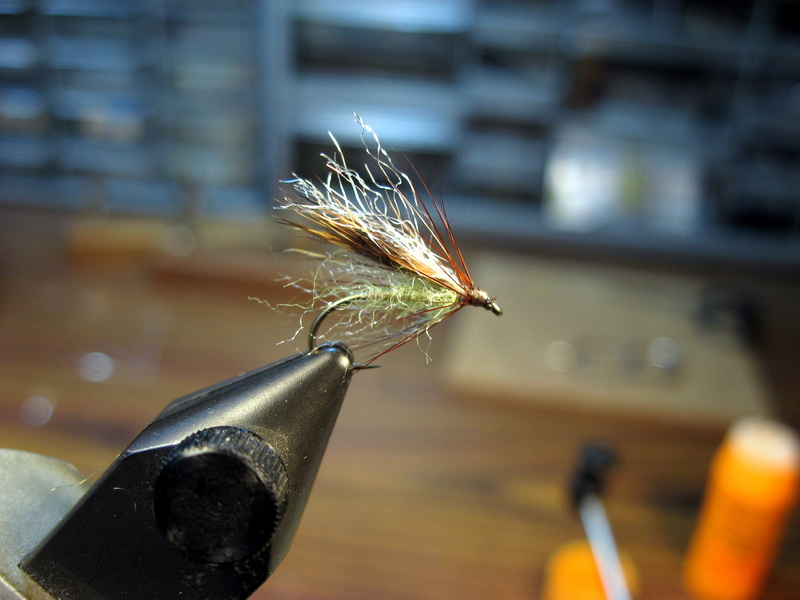 The way to combat this problem is to simply drop a small nymph or emerger 18″ behind the Air Head. The Air Head now becomes a hooked strike indicator. Why carry the Air Head? 2. It floats like a cork and can easily suspend a trailing fly. 4. Bonus: panfish love this fly! 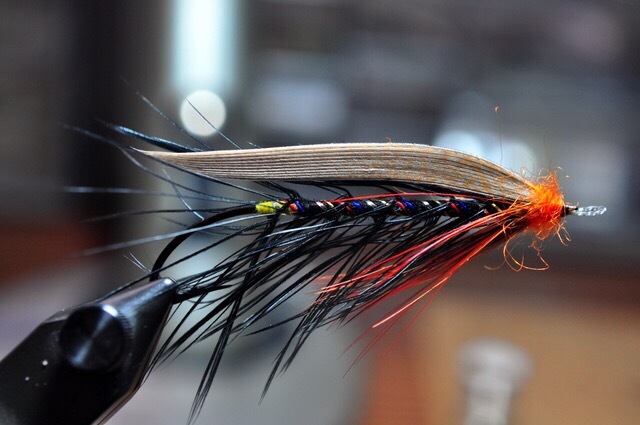 Try it on a standard size 16 or tie it on a light wire scud hook in sizes 12-14. Head: Bullet head of clear packing foam creating foam spikes that cover the wing and extend beneath the shank. This is one of my favorite LaFontaine patterns. It is truly a “go-to” fly for me and many others. Why? It is an excellent crossover pattern that can be fished – lake or stream – throughout the water column. On a wet fly hook, it sinks nicely. On a light wire hook, it can be fished in the film. 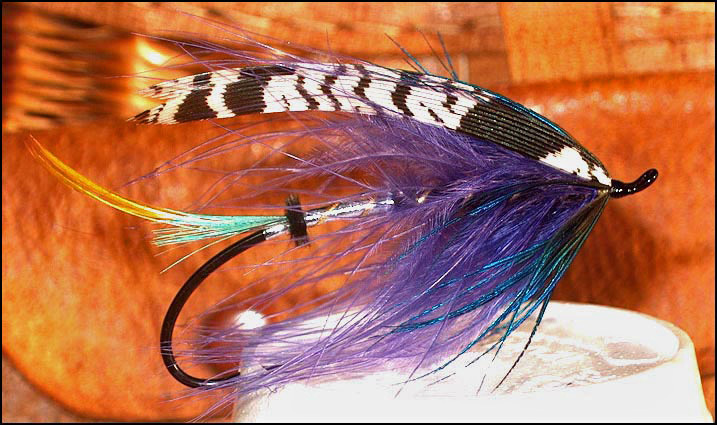 It is a simple wet fly with a clump of soft hackle feather fibers as a down wing, covered with strands of clear antron. The antron – in both body dubbing and wing – is the magic material. It is designed to imitate “plastron respiration.” Plastron Respiration: the female insect takes an air bubble with her when diving underwater during egg-laying activity to allow her to breathe. The Diving Caddis imitates the female egg-laying stage of the caddis fly. 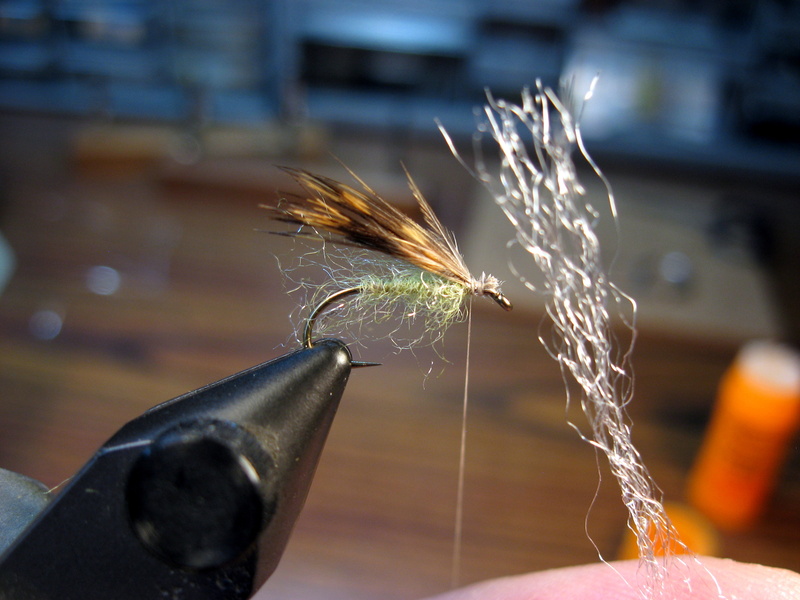 The air bubble trapped by the antron allows this fly to be used as an emerger as well, so it is crossover pattern often used when an Emergent Sparkle Pupa would be in order. It can be greased and fished on top, too. 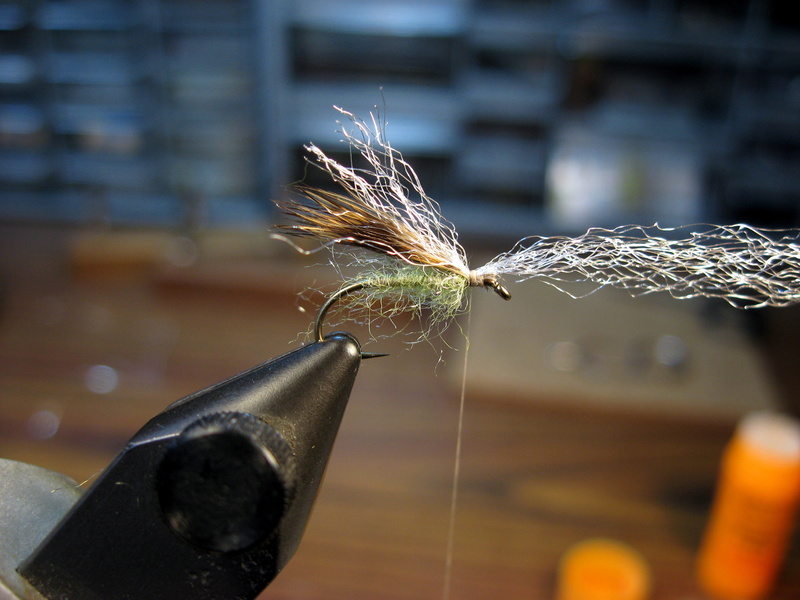 It is a solid all-around pattern when caddis are about. Attach thread and wrap to rear of hook. Take a sticky dubbing wax and run it over the thread, trying to cover all sides. Be careful to avoid clumps of wax. Take a bit of your antron dubbing and dab it along the thread. 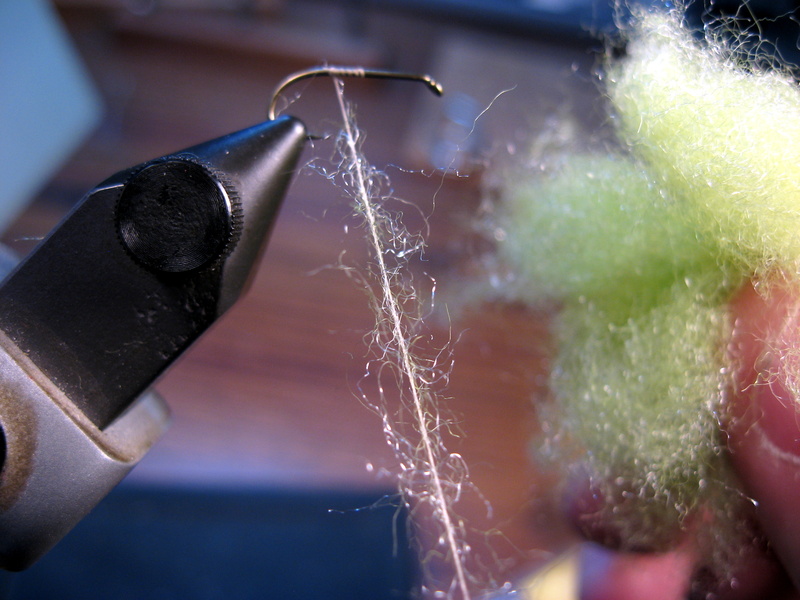 Fibers will stick to the heavily waxed thread. Do not touch or roll the dubbing with your fingers; you want to wrap it just as it is. Note: Touch Dubbing was a term coined by Gary that is simply a mixture of antron fibers and similar colored fur. 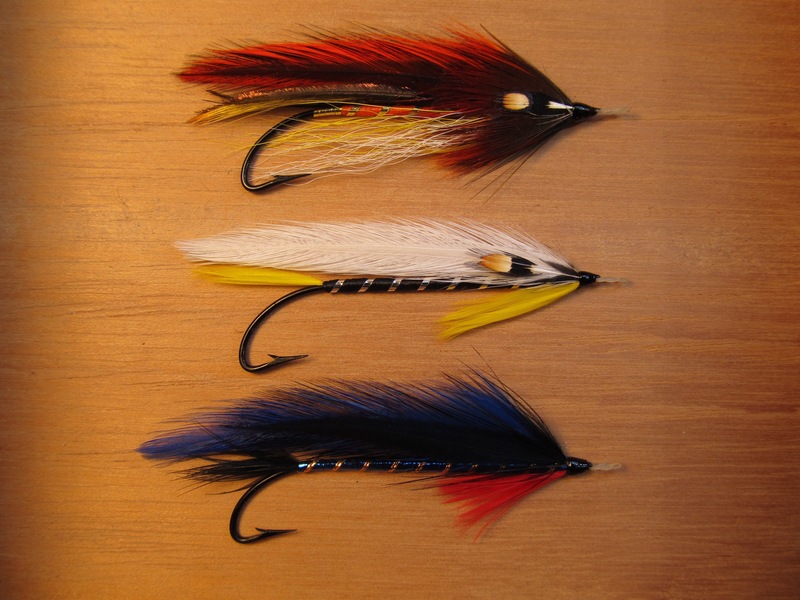 You can find the pre-mixed dubbing at some fly shops and through Gary’s old company, The Book Mailer. 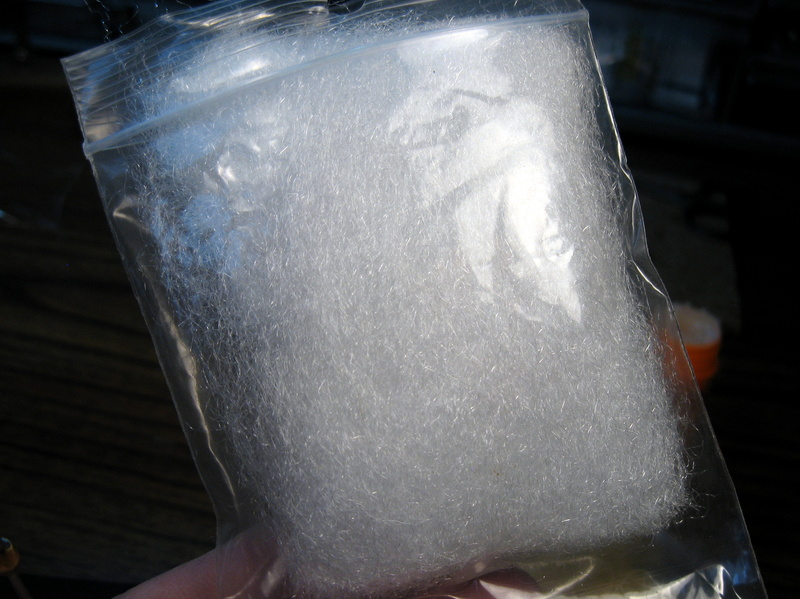 You can make your own by cutting antron ‘sparkle yarn’ into 1/4″ lengths, adding a similar amount of rabbit fur, and blending the mixture in a coffee grinder. This is what your dubbing thread should look like as you get set to wrap the body. Note the sparseness. Wrap forward to complete the body. 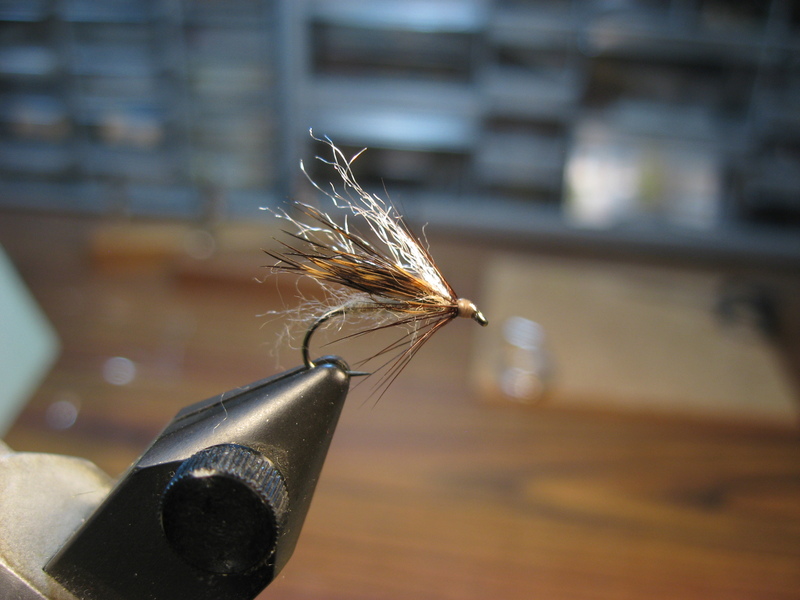 For brown soft hackle fibers, I have selected a grouse body feather. 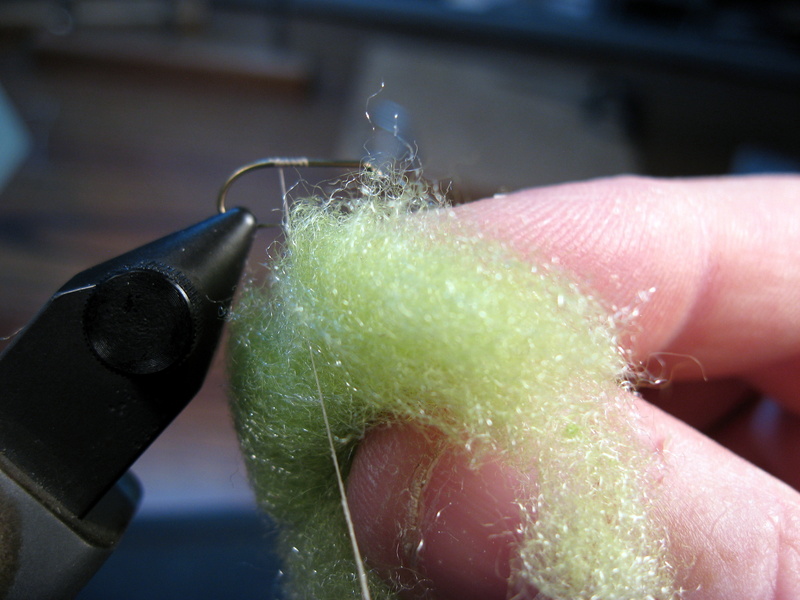 I will pull a few fibers from either side and roll them into a clump that I can add to the top of the hook. The wing has been attached (length just beyond hook bend) and awaits the application of a few strands of clear antron. This is a package of clear antron. It is also sold under the “Hi-Vis” label. Do not use spooled antron, as it does not possess the same properties. The antron, slightly longer than the grouse fibers, completes the wing. 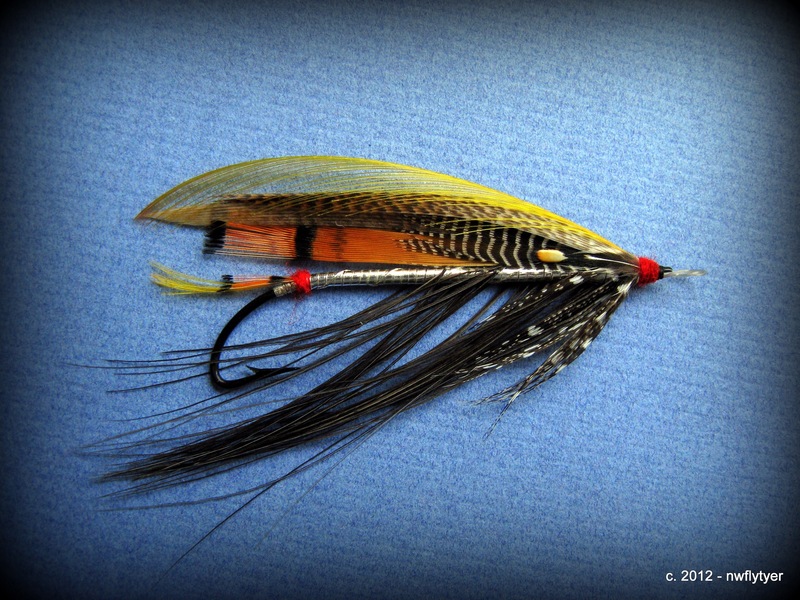 The hackle is a low-grade dry fly hackle to be wrapped a couple of times at the front. It is not supposed to make the fly float, so do not over apply. I have attached the hackle by the tip on the far side. 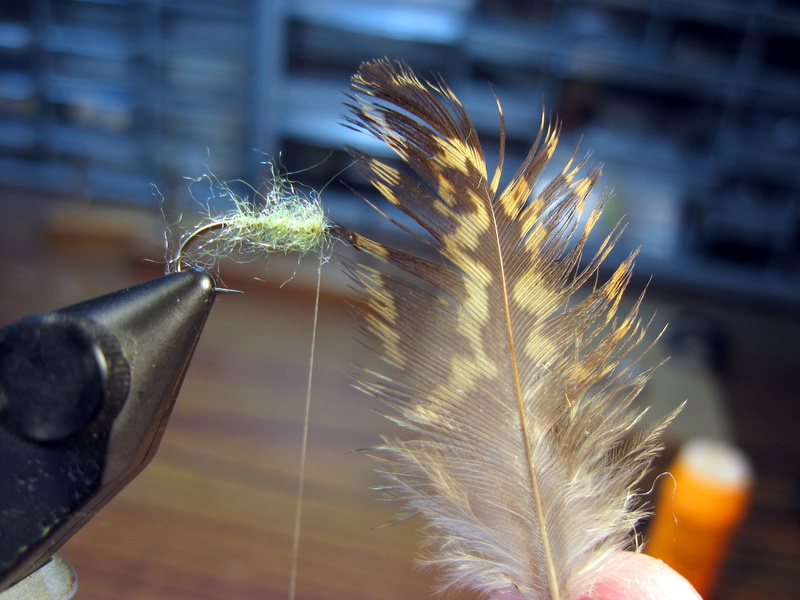 Two turns of hackle are made and then the thread is used to force the fibers back over the fly. 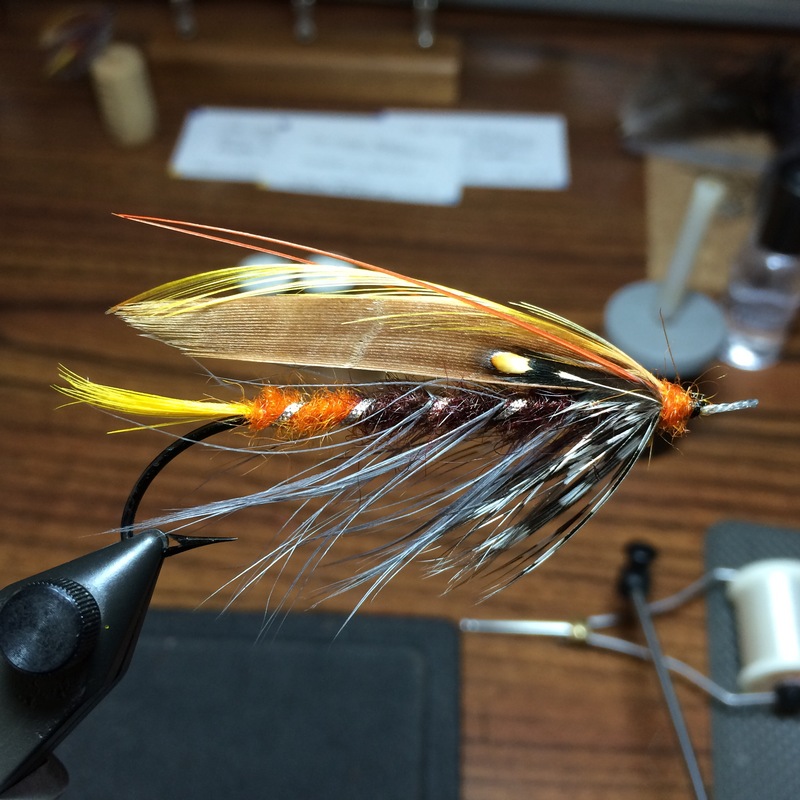 I’ve been doing a little tying with bronze mallard lately, and I was reminded of some notes I put together awhile back for a couple of Spey classes. Sorry there are no pictures…perhaps I will add some later. 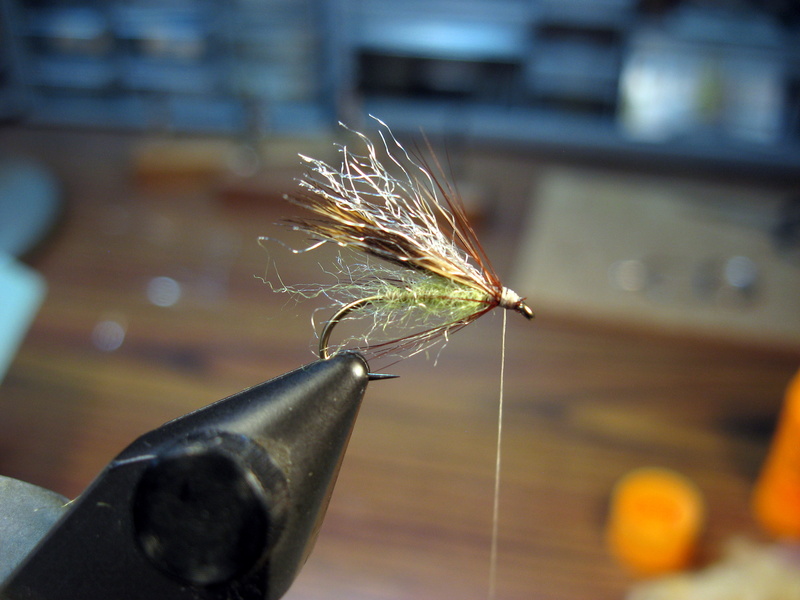 In the meantime, I hope this might help the budding Spey fly tyer. 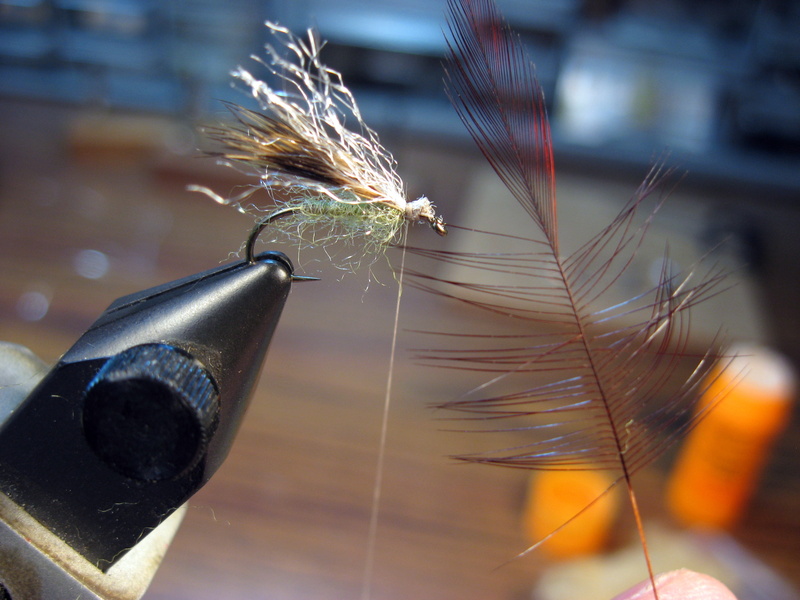 Incidentally, these tips pertain to forming a mallard roof on your full-dress salmon flies, too; just pare down the width of the mallard strips. 1. Get good quality bronze mallard. Long fibers with grey roots (it’s a softer part of the feather and easier to mount) and tips that tend to stick together (you don’t want the tips to fray or splay out). You must bind the mallard to the hook over the grey section of the feather to avoid it splitting and/or rolling out of position. 2. 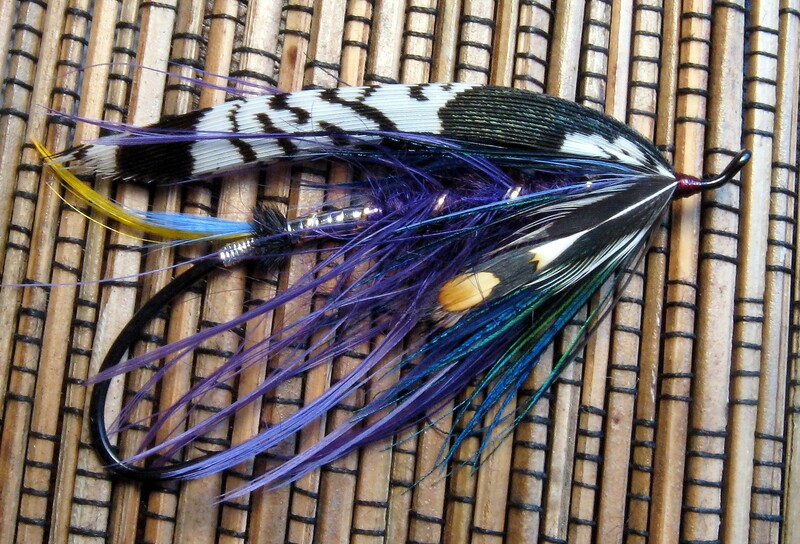 When snipping the mallard sections from the feather, leave the stem (rachiis) on your slip. This will hold things together as you form your wing. 3. Use two matching quills when selecting your mallard slips. Your slips will meld together much easier that way, and look good too. Otherwise, it can be a battle to get them to work together. Use fairly thin feather sections to start with (⅛” – ¼” per section). It will make the material less likely to bunch up or roll and ruin your wing. This width of the mallard slips can be increased as you get more comfortable with your techniques, if desired. 4. Try to keep the head area free of any other materials where you will apply the wing. It’s really tough to set mallard on top of another material. Careful tying of the throat materials is important so as not to create a “bump” at the head that must be overcome when applying the wings. You can, if needed, create a nice platform with your (flattened) thread, if necessary, snug up against your throat material. 5. One method of mounting is to use a left side slip for the near side, and a right side slip for the far side. I align the ends and “hump” them together as a single unit (remember tip #2?). 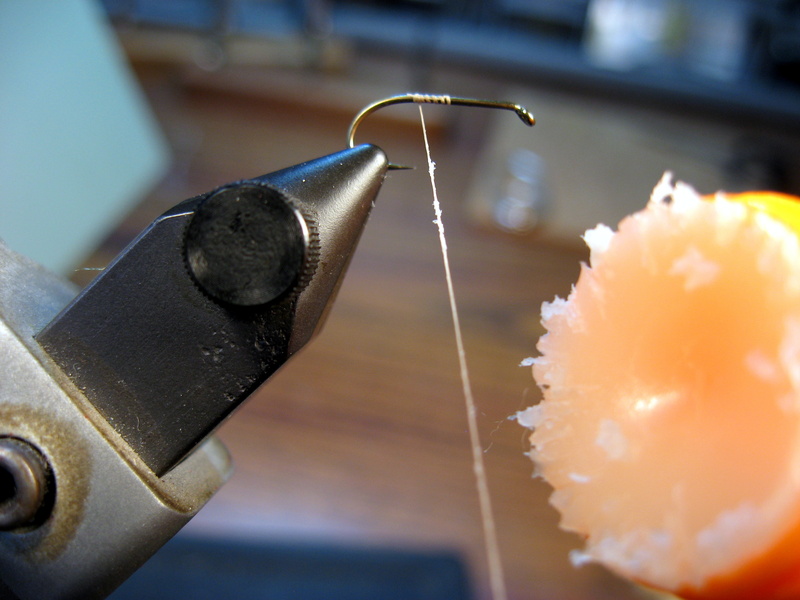 Then apply it to the hook as one wing, using a soft loop to hold it in place and then tighter wraps to secure. The key to this method is to have these slips of mallard hold against one another and retain the shape of your wing. 6. You can also apply the wing slips one at a time. I’ve started using this method more and more as of late where I apply the far side and hold it with a wrap or two. Then apply the near side slip using that far side section as a brace. You can slide the near side wing right up to your brace and then use your fingers to adjust the final position. It’s amazing how you can sometimes just squeeze the wing sections into proper alignment after applying them in this manner. 7. 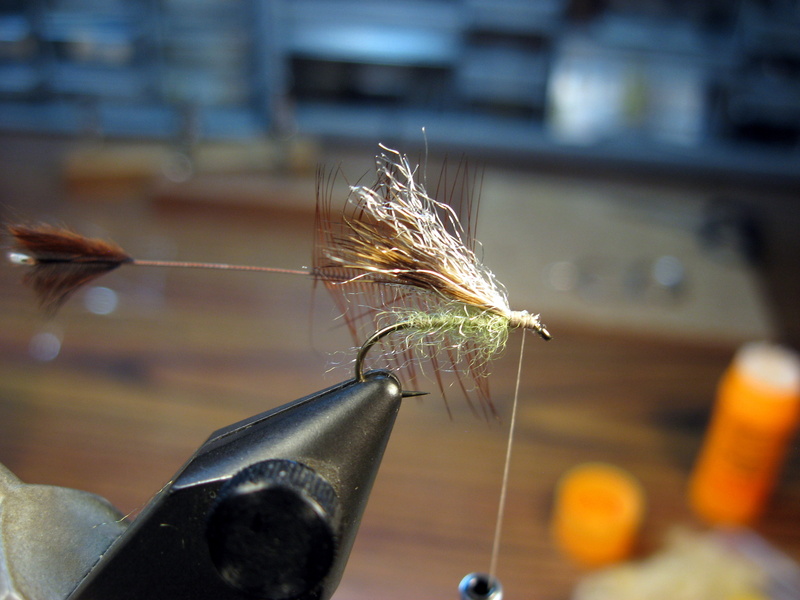 Both of the methods described will also work if you want to reverse the mallard slips and work with a right side feather section for the near side wing. This will give a distinct downswept appearance to the wing. 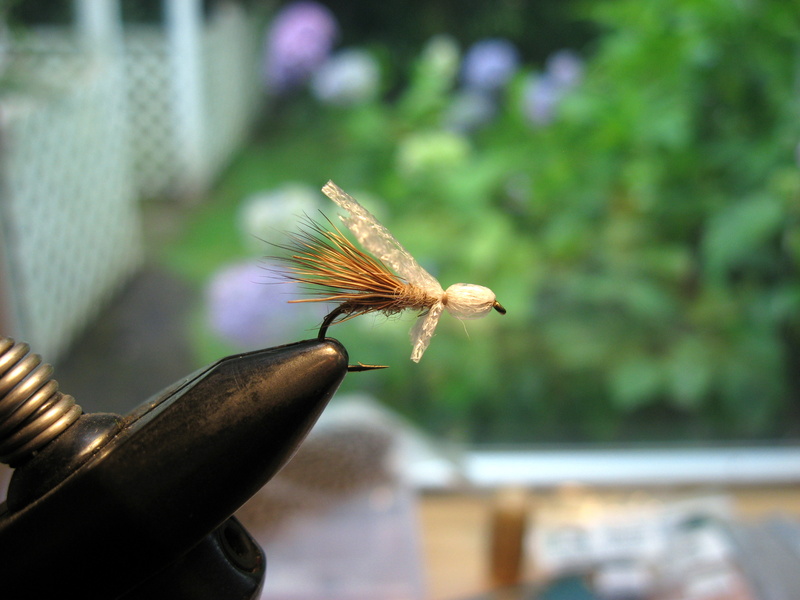 I happen to prefer the upswept appearance at the end of the wing, and the left side = near wing follows how I apply married strips on full dress salmon flies. So it keeps it consistent for me. But many tyers go with the right side = near wing, so feel free to experiment to see what looks good and works for you. 7. 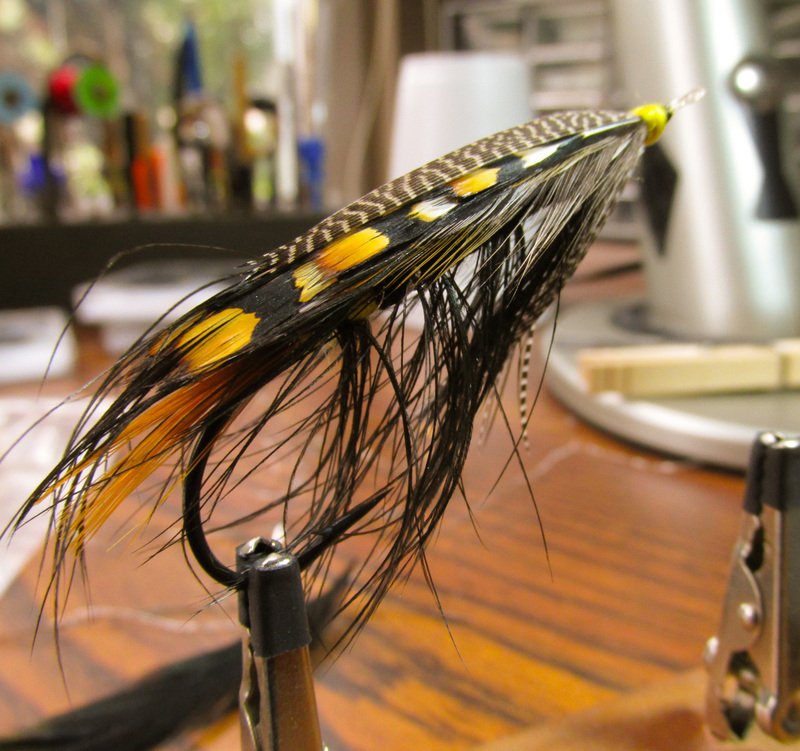 A final method of applying a bronze mallard wing is also probably the simplest: using a single slip of feather and folding it in half before tying it on. Select a ½” or so width of mallard. Pull it out so that it is perpendicular to the stem. Strip it off with a quick pull – do not cut it, as you want a bit of the stem to remain to help hold it together. 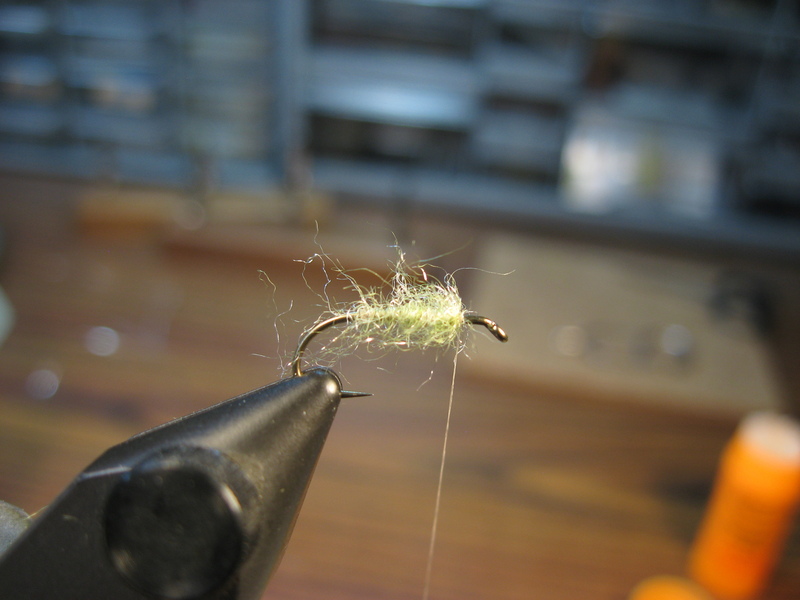 Fold the slip in half and give it a bit of curve so that it will hug the body of your fly, and attach to the hook with a soft loop of thread to hold it. 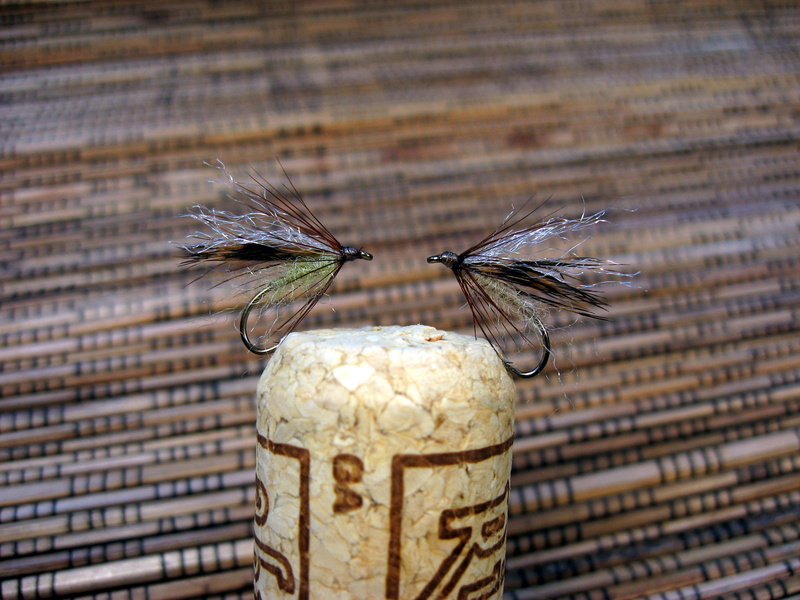 Position it with your fingers and then follow with a couple of snug wraps to set your wing in final position. Voila! These are notes compiled when taking a streamer tying class from the late Harry Gross in February 2003. 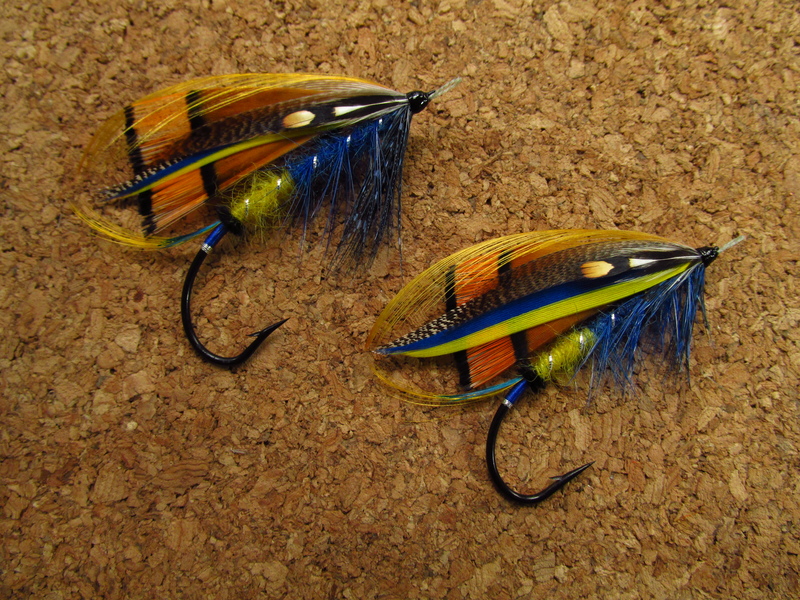 I have added these to the Tying Notes page and can be found by following the link below. 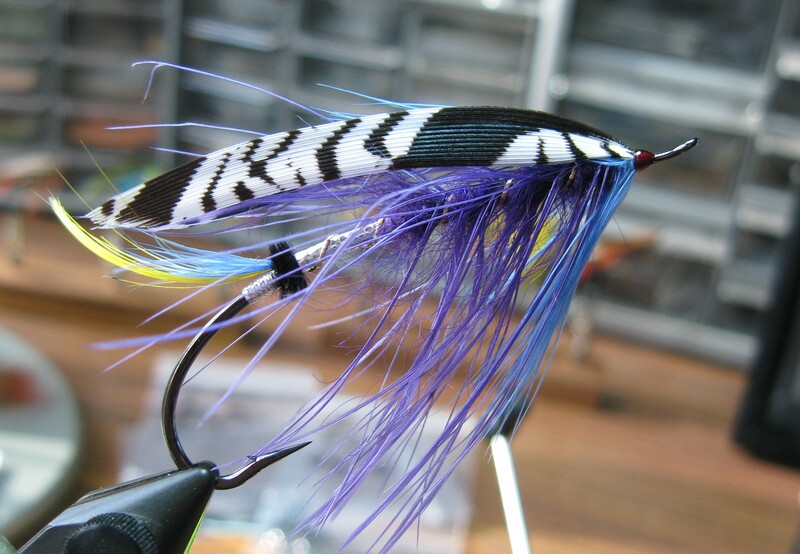 -Classic Streamer Class Notes « Northwest Fly Tyer. 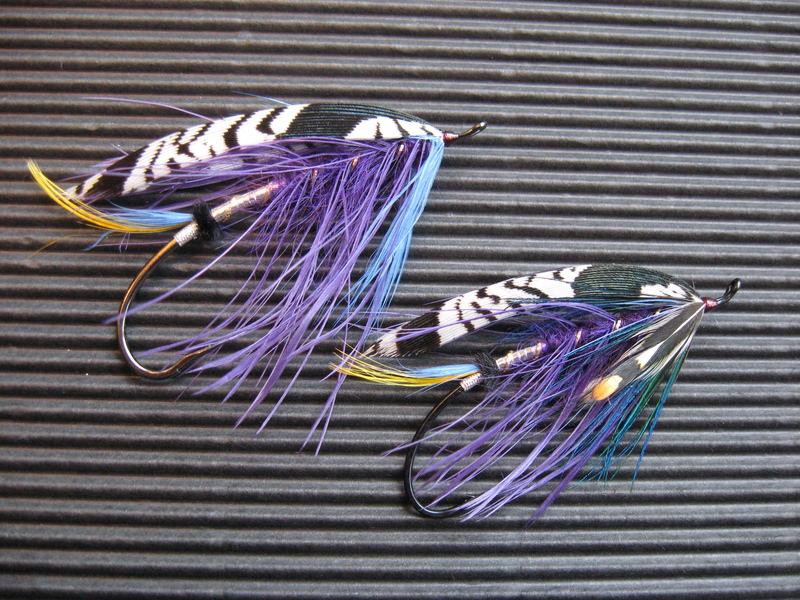 Perhaps there will be some items here for the streamer tyer that will prove helpful. 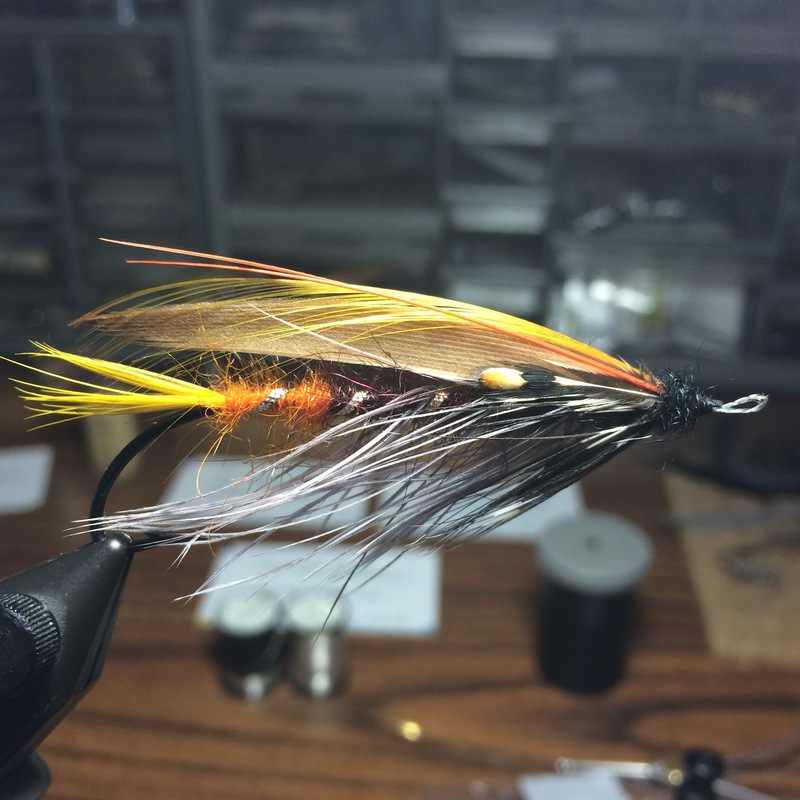 Inspired by the famous Mickey Finn streamer.